I like the development in the new German government. #1 CDU getting closer with #4 FDP (Free Democratic Party) in climate and energy policies while potential partner #5 Greens go more idiotic and watermelon-ic (green outside, red inside) in demanding zero coal power. The Greens have more commonality with #2 SDP and #6 Linke (commies). CDU is correct -- if they follow the Greens for the sake of coalition-majority, #3 AfD will greatly benefit and further expand as AfD is explicitly anti-renewables alarmism and cronyism. Germany having 3rd highest electricity prices in the world might move to 2nd or 1st if the Greens-SDP agenda will prevail. 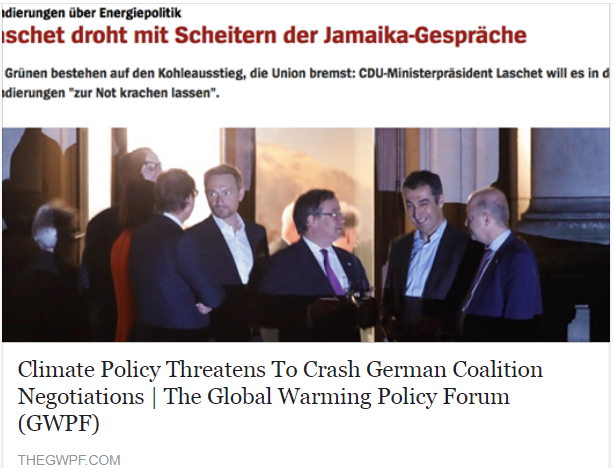 "Kellner reiterated the Greens’ position that Germany should quickly close coal-fired power stations to help fight climate change, a position resisted by the other parties." "While all parties agreed in principle this week that they want to uphold the Paris climate accord, the FDP is pressing for a commitment to curb government measures to promote renewable energy, which help make German power prices the second-highest in the European Union after Denmark’s. It is good that both CDU/CSU and FDP are jointly resisting the deindustrialization goal of the Greens. One reason why AfD rocketed high to nearly 13% of the votes despite being created only 4 years ago is on the energy mini-suicide of the watermelon groups. US economic growth of 3%, due to deregulation? If we exclude the years 2008-09 because they were outliers (global financial upheaval), the Obama years seem to be the weakest since 1990. Never experienced growth of 3% or higher. Early peek of the Trump admin first 3 Quarters of 2017, experienced 3% growth in the last 2 quarters (Q2 and Q3). 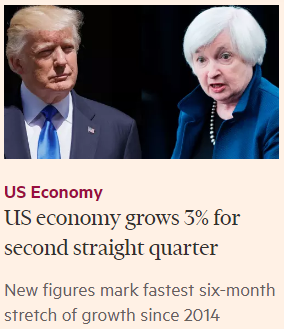 Fastest 6-months growth since 2014, because of Trump or Yellen or something else? One of Financial Times' headlines today. If the 3%+ is retained in Q4, it will be called the "fastest 9-months growth since ____". This chart below could be one explanation -- US stocks growth the past year was rather fast compared to other major markets (China/Shanghai, Japan/Nikkei, Germany/DAX). The 2008-09 crash was a product of multi-decades of moral hazards problem in housing finance, not just 8 years of the Bush Jr. era. 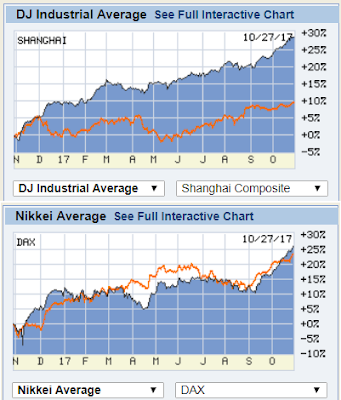 A friend noted that "an institutional collapse like 2008 is followed by many years of slow growth and stagnation. The Philippines had the same experience from 1983 through the 90's. From 1991, Japan nearly had two decades of below-average growth." Good points, he was arguing the slow growth momentum, which actually applied also to the rest of G7 economies. But not to China, India, other Asian economies. 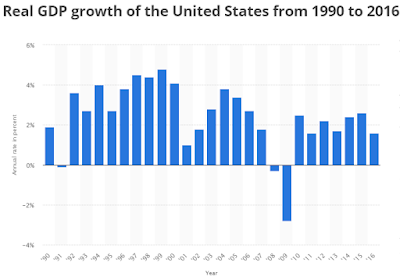 My hypothesis for the rather fast growth of the US economy in the last 2 quarters -- somehow a growth momentum due to some of his deregulation, de-bureaucratism policies. And the big tax cut plan, it's seeping into business decisions, big investments may be coming to the US from abroad and big investments in the US won't migrate to other countries anymore. * This is my article in BusinessWorld last October 19, 2017. Political science masquerading as climate science insist that the gas that we humans and our animals exhale, the gas that is used by trees, flowers, fruits and other crops to grow and feed the world — carbon dioxide or CO2 — is a pollutant that must be over-taxed and over-regulated. Far from the truth. CO2 is a useful gas, not a pollutant. 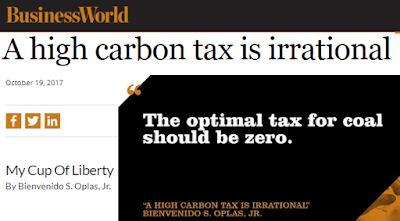 Since it is useful, the optimal carbon tax for coal in particular is not P10/ton, not P20, not P600, but zero. However, a zero tax on coal is unpopular from the world of climate alarmism, so we classify these tax rates as follows: P0 tax is optimal, P10/ton is rational, P20/ton is compromise, P600 is irrational. 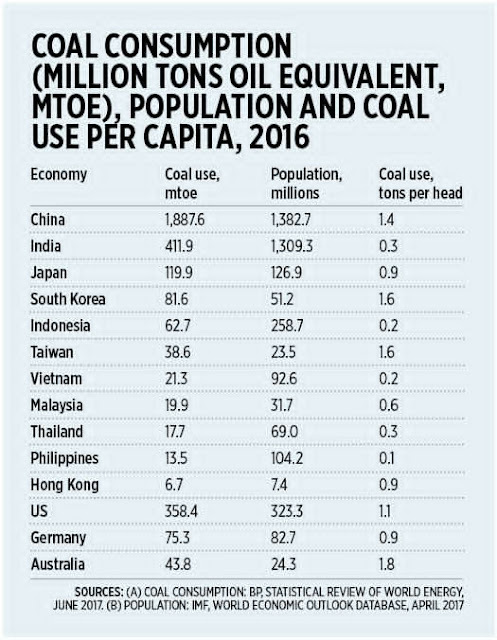 Recently, eminent economist Dr. Ciel Habito made a follow-up paper, “The case for the carbon tax” and insist that the carbon tax for coal should be raised from the current P10/ton to P600/ton. Wrong. CO2 is 400 ppm or only 0.04% of all greenhouse gases (GHGs). About 95% of GHGs is water vapor — the clouds, evaporation from the seas, oceans, lakes, rivers, stomata of leaves, etc. The remaining 4%+ are methane, nitrous oxide, others. This is perhaps 5% geological science and 95% politics. The Minoan, Roman, and Medieval Warm Periods (when there were no SUVs, no coal plants, no airplanes) were much warmer than the Modern Warm Period (mid-1800s to roughly 2000). There were wild swings in global warming and global cooling cycles regardless of the CO2 level. How would one call this — “much less frequent extreme weather events than today?” Garbage. Climate change (CC) is true. All skeptics recognize climate change, recognize global warming. Planet Earth is 4.6 billion years old and there were climate change all those years because climate change is cyclical (warming-cooling-warming-cooling…) and natural. Global warming is true, and so is global cooling. It is political science that masquerades as climate science to say that there is no climate cycle, that there is no global cooling that takes place after global warming. From the recent energy and economic experience of our neighbors in Asia and some industrial countries in the world, the hard lessons are these: (a) Countries that have coal consumption of at least 2.1x expansion over the past two decades are also those that experienced fast GDP growth of at least 3x expansion. • Stop breathing too often; more exhalation means more CO2 emission. • Stop adopting pets (if any), stop eating chicken, pork, meat because these animals exhale CO2. • Stop using their cars, not even jeepneys or buses, they emit CO2; skateboards and bicycles only. • Stop riding airplanes and motorized boats, they emit CO2; solar planes or big kites and sailboats only. • Stop connecting from the grid and from Meralco because 48% of nationwide electricity generation comes from coal; no gensets either. Use only solar-wind-biomass + candles at home. • Tell their friends, business associates, family members, to do the same so that there will be more people emitting less CO2. The Habito proposal of more expensive electricity via P600/ton carbon tax on coal is dangerous because while the Senate version of TRAIN adopts a P20/ton excise tax, the P600 can spring up somewhere during the final and Bicameral Committee meeting. The proposal should be exposed as based on political science, not geological or climate science. 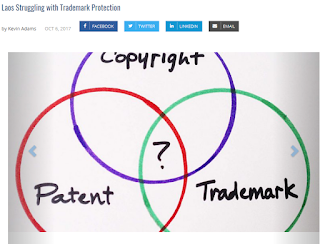 Property rights protection of both physical and non-physical/intellectual -- trademark/logo, copyright, patent, etc. -- is among the cornerstones of dynamic, mature and market-friendly economies. Individuals and enterprises develop new products and services via innovation and they create new value, new wealth for society. 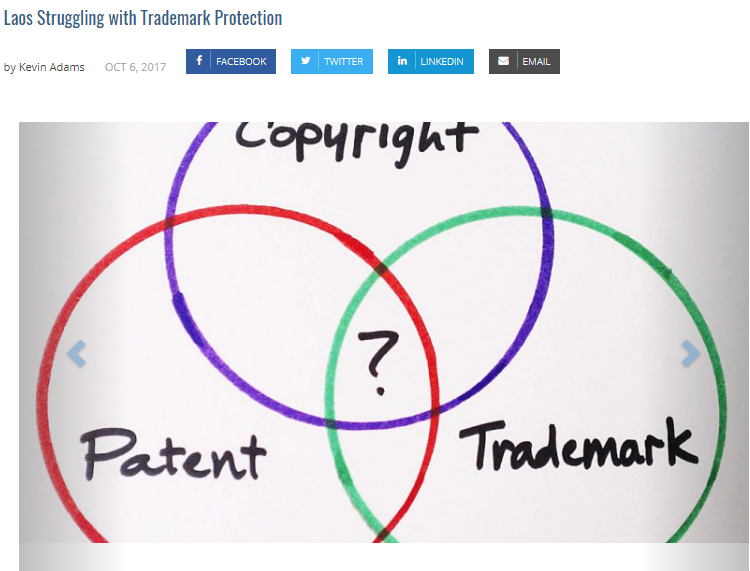 I am reposting some developments on IPR in the ASEAN. Thanks to the Property Rights Alliance (PRA) for the bi-weekly IP updates. There's a role for intellectual property protection in the Thailand 4.0 vision and initiative, and the national government's Intellectual Property Department sees a role for itself promoting innovation through offering increased knowledge sharing and more convenient services. "We are a key mechanism in protecting new technology and innovation vital to economic development, and we do this by motivating new developments," said Thosapone Dansuputra, director-general of the department. As of November 2017, Thailand will accede to the so-called Madrid Protocol as member no. 99. This entails cost savings compared to previously when trademark proprietors are to register their trademarks in Thailand. The Madrid Protocol is an international system through which trademark proprietors may apply for protection in several countries through one basic registration. Website blocking in Malaysia has significantly reduced online piracy, with a 74% fall in traffic to pirate websites recorded in the six months after the government initiated its sixth effort to block such sites in June 2016, says the Motion Picture Association (MPA). As pirate websites generate income through advertising revenue, a disruption to their business model can help stop online piracy, said Oliver Walsh, regional director at the Asia-Pacific hub for Motion Picture Association International (MPA-I). The number of trademark registrations is lagging in Laos as many businesses lack understanding of their rights and fail to register to protect their intellectual property, according to the Intellectual Property (IP) Department under Ministry of Science and Technology on Monday. According to a study by the Intellectual Property (IP) Department of the Ministry of Science and Technology, only about 40,500 trademark applications have been filed in the Southeast Asian country since 1991. This is a relatively low number of applications for trademark protections for a country of 7 million and an economy with a GDP of $37.3 billion. On August 28, 2017, the Brunei Intellectual Property Office (BruIPO) signed an agreement to introduce a new patent examination initiative - the Patent Prosecution Highway Plus (PPH+) - with the Japan Patent Office (JPO), which commenced on October 1, 2017. Using this PPH+ system, patent prosecution procedures in Brunei are accelerated by allowing BruIPO to reuse the search and examination results of corresponding patent applications filed in Japan - thus reducing examination workload and time, minimizing costs, and improving patent quality. I like this article by a friend since 2004, Andrew Pak Man Shuen, Director and Co-Founder of the Lion Rock Institute in Hong Kong. I thought it was Sir John Cowperthwaite who was the first engineer of HK free trade policy. Reposting, did not include the first four paragraphs. Photo I got from wiki. … Sir Henry Pottinger was our first colonial governor. After the Opium War, he turned Hong Kong into an outpost of the British Empire so distant that Victorian parents would threaten to send unruly children there as a punishment. He laid out the three basic governing tenets of Hong Kong. The first was that there must be no direct taxes: government revenue would come from land leases, licensing fees etc. The second was to “respect local customs”. Finally, Hong Kong would allow free trade, including with the enemies of the British Empire. From the perspective of the 21st century, it is easy to conclude that Potting must have been a liberal. No direct taxes. Multiculturalism. Free trade. And all for a city built on commerce. But, before celebrating, we must bear in mind that Pottinger was a hard-nosed colonialist. He and his colleagues had no qualms about butchering the “yellow peril” as they barrelled into Qing-dynasty China. So why those three seemingly enlightened tenets? Remember that this was before the telegraph and the Suez Canal. Britain was not all that keen to hold a colony that was not only far away but surrounded by hostile powers. London sent the message to Potting that he would not be receiving much in the way of manpower or budget. Hence it was out of realpolitik that Potting embraced those principles. First, the collection of direct taxes is extremely labour-intensive; without them, he could manage with a much smaller civil service. Second, although the Chinese of that era engaged in polygamy, female pedal mutilation and (perhaps most objectionable to the British) eating dogs, Pottinger knew that he was in no position to engage in mass behaviour-modification. If everything the Chinese were doing was allowed to stay legal, the police force could remain small and still be effective in the protection of property rights. The decision to make Hong Kong a true free port where even the enemies of the British Empire could trade was a master-stroke. 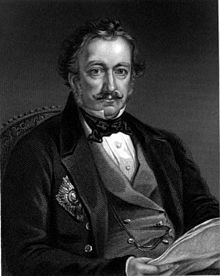 Pottinger understood that the colony would be hard to defend with military force. To sail from Plymouth, the home port of the South China Sea fleet, round the Cape of Good Hope, across the Indian Ocean, through the Malacca Straits and then up the South China Sea was a logistical nightmare even in peacetime. However, Pottinger also knew that, as Hong Kong possessed no natural resources to be pillaged, together with the fact that attacking any part of the British Empire would incur a cost for the invader, any assault must be part of a grander strategy for an invader in search of a prize other than this colonial outpost. If the would-be invader discovered that they could purchase whatever they coveted from Hong Kong, it was not worth the effort. This explains what happened during the Korean War. The British colonial administration must have known about the smuggling activities of Henry Fok, who was transporting massive resources to Communist China. The latter had been placed by the United Nations under a total trade embargo. This meant that free-trade colony under British control was a lifeline for Mao, and far more useful than a Chinese-ruled Hong Kong. As a result, Hong Kong remained British until 1997 – that is, 50 years longer than India. Its sovereignty was preserved because the power most likely to invade was protecting it. This makes Pottinger look like a geopolitical genius. Of course, Hong Kong’s sovereignty did change hands once before 1997. In 1941, Japan invaded as it simultaneously rained bombs on Pearl Harbour, and we surrendered in three weeks. If Pottinger’s adoption of free trade was such a master-stroke, how come Hong Kong fell to the Imperial Japanese? Next to the Yasukuni Shrine in Tokyo, which commemorates the war dead, there is a museum that is basically an attempt by the Japanese to explain what they did. One word is crucial: oil. According to Pottinger’s theory, if the Japanese could have bought oil through Hong Kong, the Pacific War with the Allied forces might have been averted. Of course, this also means that Hitler would have never declared war on America. And that was not what Churchill wanted. That raises the question of why Hong Kong uncharacteristically participated in the oil embargo and suffered invasion – but we can leave that discussion for another day. To conclude, the logic of “when goods don’t cross borders, soldiers will” that underpinned the Treaty of Rome was on full display in Hong Kong. Peace and sovereignty flow from the fountain of authentic free trade, even in the absence of soldiers and Ian Fleming’s secret agents. And, of course, there is another consequence of authentic free trade, which is massive and widely shared prosperity. That is also on full display in Hong Kong. Fake stories and disinformation can be rampant in the energy sector because of the climate alarmism drama and renewables cronyism agenda. 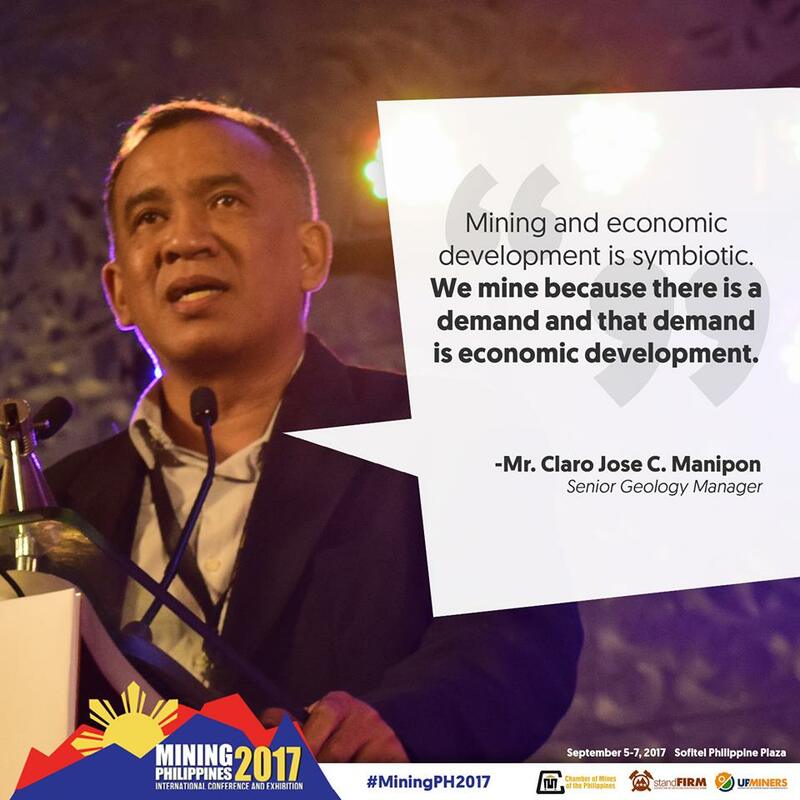 A recent example is one published in BWorld last Thursday, The Philippines’ Ill-Advised P1 Trillion New Coal Gamble, October 20, 2017 By Sara Jane Ahmed. à Wrong. Check Meralco website for customer charges, http://www.meralco.com.ph/consumer-information/rates-archive. Here, October 2017 charges, if one consumes up to 300 kWh, he would pay a total of P2,880, one-half of which is for generation charges and the other half for 11 other charges including taxes and FIT subsidy for mostly wind-solar. From the generation charge, about half of which are from Malampaya natgas-using plants in Batangas; there are hydr0, geothermal, coal could be about 40% of Meralco energy mix. à Wrong, diesel has no subsidy, or maybe she refers to the current zero excise tax for diesel but under Duterte TRAIN, it will soon be slapped with P6/liter excise tax. à True, and that’s the exception, from Solar Philippines of Leandro Leviste, son of Sen. Loren Legarda. Many solar farms here are given the cronyist FIT or guaranteed price for 20 years of P8.69 to P10+/kWh. 5. 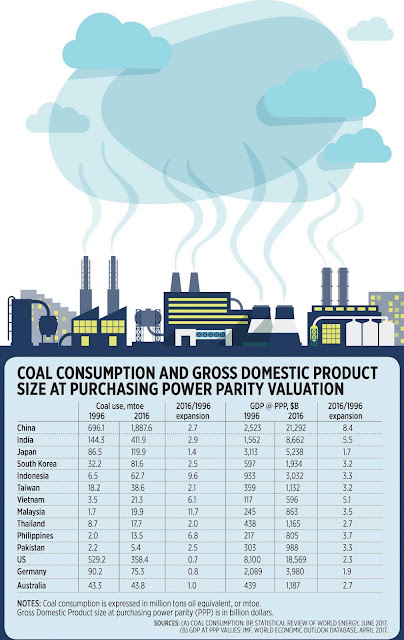 “Philippine’s financial sector as massively exposed now to the eventual stranding proposed new coal fleet to the tune of more than 10,000 MW in overcapacity and P1.05 trillion in financial risk”. 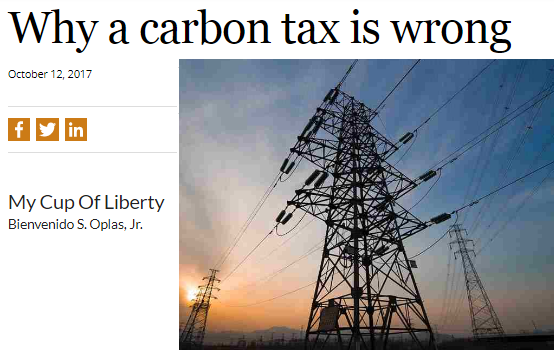 The "planet saviours", the renewable cronyism lobbyists, they want more government intervention -- in arm-twisting consumers to pay higher electricity to subsidize renewables; in coercing the grid to prioritize the intermittent, unstable, unreliable, non-dispatchable energy sources; in choking and even killing stable, reliable, dispatchable 24/7 sources like coal, gas and nuke. Watermelons -- green outside, red inside. * This is my article in BusinessWorld last Monday. 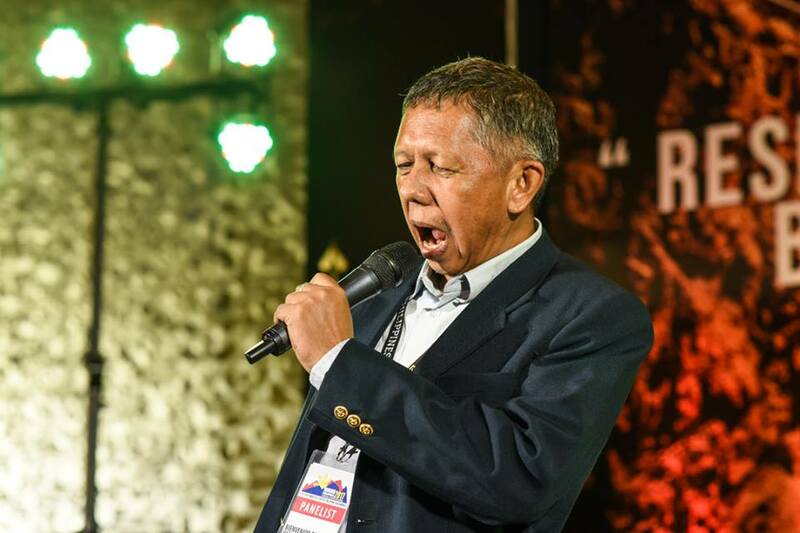 President Rodrigo Duterte has been on a rampage recently, repeating his warnings about declaring a “revolutionary government,” as if he has the authority to issue laws and orders without consideration or fear of opposition from independent-minded legislators. Among his previous rants include his order to his loyal leaders in Congress to (a) impeach the Commission on Elections (Comelec) Chairman Andres D. Bautista, (b) impeach Chief Justice Maria Lourdes P. A. Sereno, (c) impeach Ombudsman Conchita Carpio-Morales, and (d) create new rules in electoral exercises such as postponing and resetting the barangay elections. Speaking of electoral reforms, some things are better retained and while others should be changed. Among these are the following. 1. Retain automation and do not entertain the proposal by certain sectors to go back to manual counting of the votes. The number of voters in the country is rising and machines should take care of the counting and processing of results (see table). The lobbying of the son of a former dictator, Ferdinand “Bongbong” R. Marcos, Jr., to discredit the results of the 2016 national elections and canvassing for vice-president has been rejected by the Supreme Court — good riddance. It was a dangerous attempt by Mr. Marcos to unseat the elected VP so that he can be the second highest official in the country, a position that is just heartbeat away from the Presidency, a position held by his father for 20 years (1965-1985) via deception and large-scale military coercion. 2. Elections of barangay officials should be as scheduled and not subject to postponement by the President or Congress. Elections should held at regular and predictable intervals to give space and opportunity for the people to directly demand accountability from their elected leaders. Existing laws mandate fixed terms of office for elected national and local leaders. 3. No to state subsidy to political parties as proposed by certain sectors. This is a wasteful use of taxpayers money. Politicians and political parties have resources of their own or have access to a network that allows them to solicit big donations from their friends and supporters. Keep the tax money for direct subsidy to the poor, or cut taxes instead so that people can enjoy the fruits of their labor. Meanwhile, if the proposed charter change (cha-cha) should materialize, the following reforms should be considered. 4. Abolish the party list system. This is wrong in both theory and practice. In theory, there are no marginalized sectors, only marginalized individuals. Women are not a marginalized sector. The country had two women Presidents already, a number of senators and House members are women. Youth is not a marginalized sector as many young leaders are occupying very high political and corporate positions. Farmers are not marginalized as there are many rich farmers and agri-business entrepreneurs, although many farmers are indeed poor. Electric cooperatives do not belong to the marginalized sector. In practice, many non-poor individuals and groups have entered the legislature through the backdoor afforded by the party-list system. 5. Abolish the Sangguniang Kabataan (SK). Young people should not be encouraged to enter the world of politics early because government, by nature, is force and coercion. Young people should focus instead on voluntary and civil society action and learn the arts of entrepreneurship early. 6. 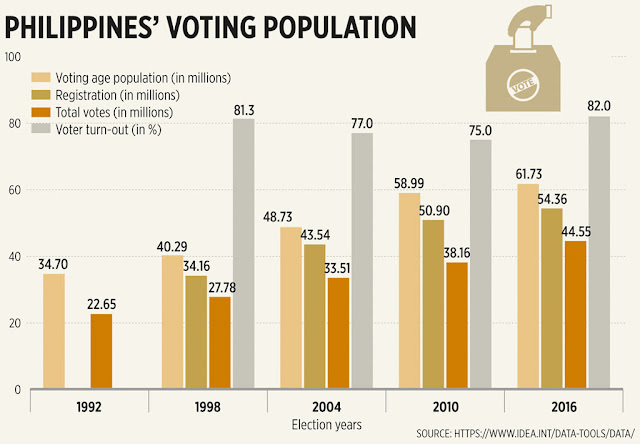 Elect only the political party, not candidates, should the Philippines become parliamentary. Once put in effect, parties will stay focused on their political ideologies and advocacy and not on personalities. 7. Go back to the two-party system. Very often, debate on public issues can be limited to whether there should be increased government interventions and regulations or fewer, whether there should be more and higher taxes or less, whether there should be free trade or protectionism. Candidates and voters can align themselves on either of two opposing positions. Many candidates can be accommodated by the two parties and they will all go through primaries and knock themselves out until only one will represent the respective party. 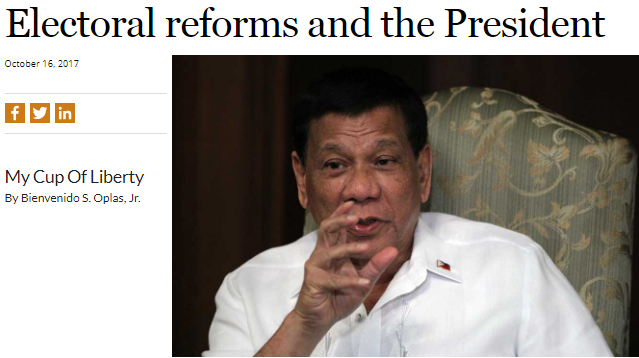 This could have prevented a Duterte win because many candidates in the 2016 elections talked about respecting the rule of law while Duterte repeatedly argued for breaking the law and short cut the process of winning the drugs war. 8. Or retain the multi-party system but have a round two elections where only the top two candidates will contest and “knock out” the other candidate in an open electoral system. I am reposting here a post by Bjørn Lomborg in his fb wall early today. Thanks for this great piece, Bjorn. The world is mostly run on fossil fuels (81.4%). Nuclear makes up 5% with 13.6% from renewables. 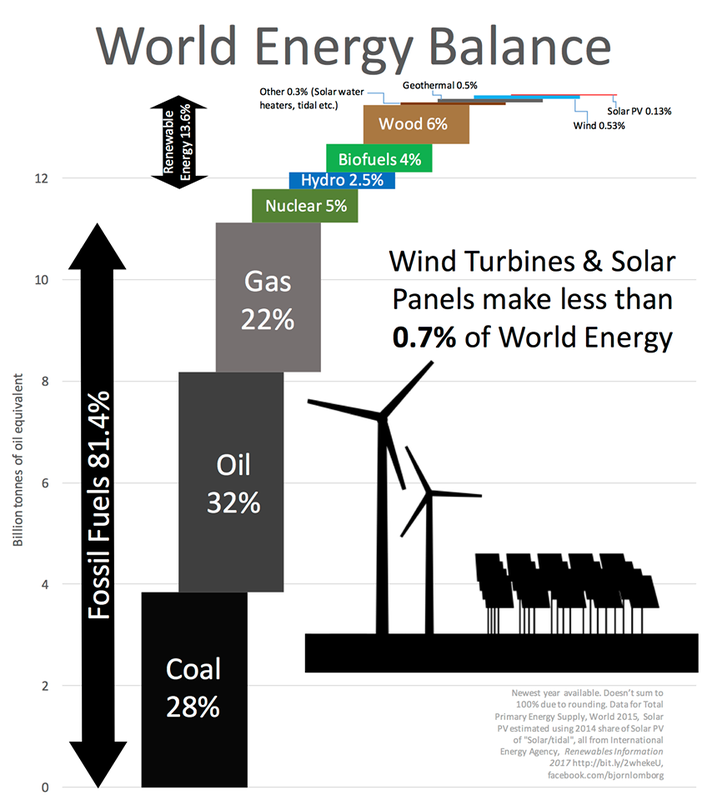 Solar panels and wind turbines contribute less than 0.7%. When you hear 13.6% renewables, you will likely think 'wow, things are going pretty well with the change-over to renewables'. But these are not the ones you hear about. The biggest contributor is wood, used in the poor world to cook and keep warm. This leads to terrible indoor air pollution – it is actually the world's deadliest environmental problem, killing some 4.3 million people each year. We should definitely hope the poor will have to use *less* polluting wood in the future. The other main contributors of renewables are biofuels (e.g. the American forests, cut down and shipped across the Atlantic to be burnt in European power plants to be called green and CO₂ neutral) and hydropower. In total, that makes up 12.1%. The last 1.5% comes mostly from geothermal energy (0.54%) and wind turbines (0.53%) along with solar heaters in China, tidal power etc. (0.29%) and solar panels (0.13%). Sources: The International Energy Agency has released their latest Renewable Energy Information 2017, http://www.oecd-ilibrary.org/.../renewables-information.... It contains 488 pages of data, with preliminary data for the rich world for 2016, but for the entire world for 2015. Unfortunately, the data is not free. Since solar PV constitutes such a small part of the energy supply, the International Energy Agency combines it with tidal, solar CSP and solar thermal (the water heaters on rooftops for direct hot water). In 2014, the split was 34% for solar PV, 0% for tidal, 6% for CSP and 60% for thermal, so I applied the same split to the data for 2015. All data is Total Primary Energy Supply, which is the International Energy Agency's own main measure, also used in all their graphs for global energy balances. Labels: Bjorn Lomborg, fossil fuel, renewables, solar energy. 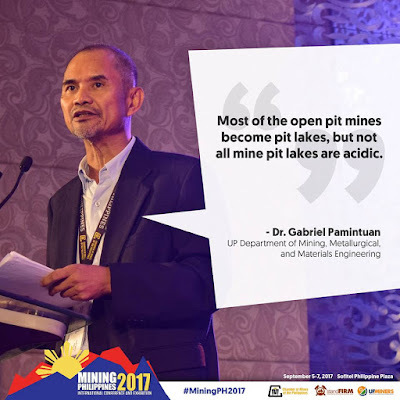 Posting some of the quotes-with-photos made by the Secretariat during the Mining 2017 Conference last September 5-7, 2017. Some of my photos at the farewell dinner. Meanwhile, reposting this article today by JB Baylon. Who’s afraid of open pit mining? 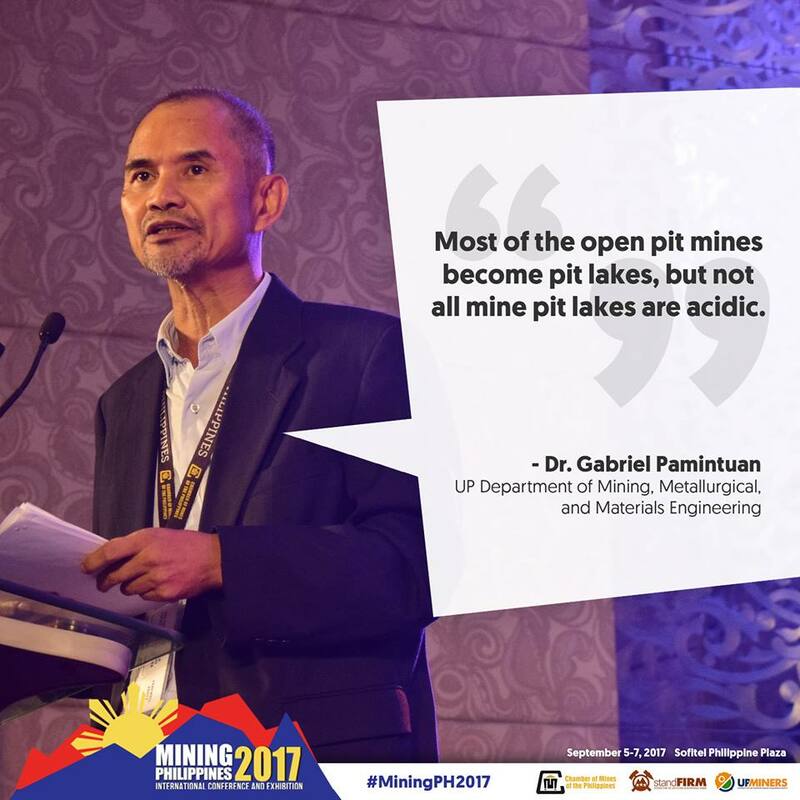 THERE’S a lot of brouhaha about open pit mining these days, spurred by Ma’am Gina Lopez alleging that they create acids that will bedevil all of humanity for life. 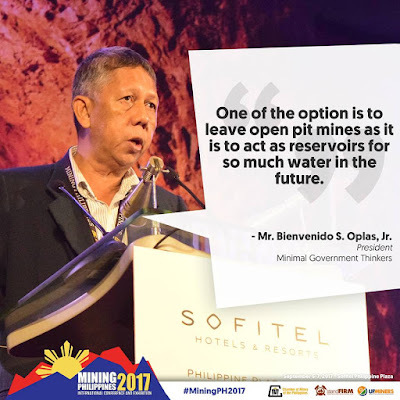 And you know how convincing she can be, so even the President has expressed apprehensions about open pit, apprehensions that could extend to actually banning this form of mining. 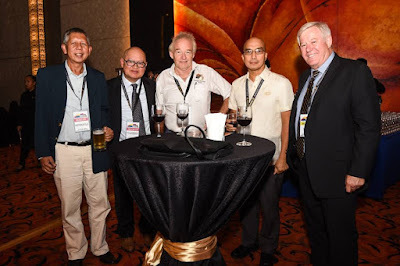 While listening to my mining colleagues discuss the issue, my genetic make up (I am the son of a doctor and a nurse and brother to two more doctors) kicked in and a very medical image cropped up. Mother Earth and many women have something in common - they are gifted with blessings that need to be brought into the world so that life can be better. For Mother Earth these are her mineral wealth; for many women, this is a child. Now women who are blessed with a child have two ways of bringing God’s gift into the world - the normal laborious method, or the sometimes quicker Caesarian section. These are two accepted methods that are used depending on the situation of the mother or the child, or both; the fact is some women can be at risk - and the child in their womb as well - if an OB Gyne does not resort to the “C-section.” My mother, for one, had to go through the C-section three times; thankfully she had the late great Dra Gloria Aragon watching over her. Again: whether a woman gives birth via the normal way or by C-Section is determined by the situation and managed by the experts. No one can say we will ban Caesarian because it leaves an ugly scar and puts a woman at risk with her anesthesia etc etc etc. Similarly the ore deposit determines which form of mining is done in order to bring out into the world the mineral wealth with which Mother Earth is blessed. An ore deposit or body near the surface of the earth is therefore mined using surface mining or open pit; an ore body that is in the form of veins or goes deep into the recesses of Mother Earth is mined via underground mining. Like a pregnant woman, Mother Earth’s situation determines the way her gifts are brought out into the light. 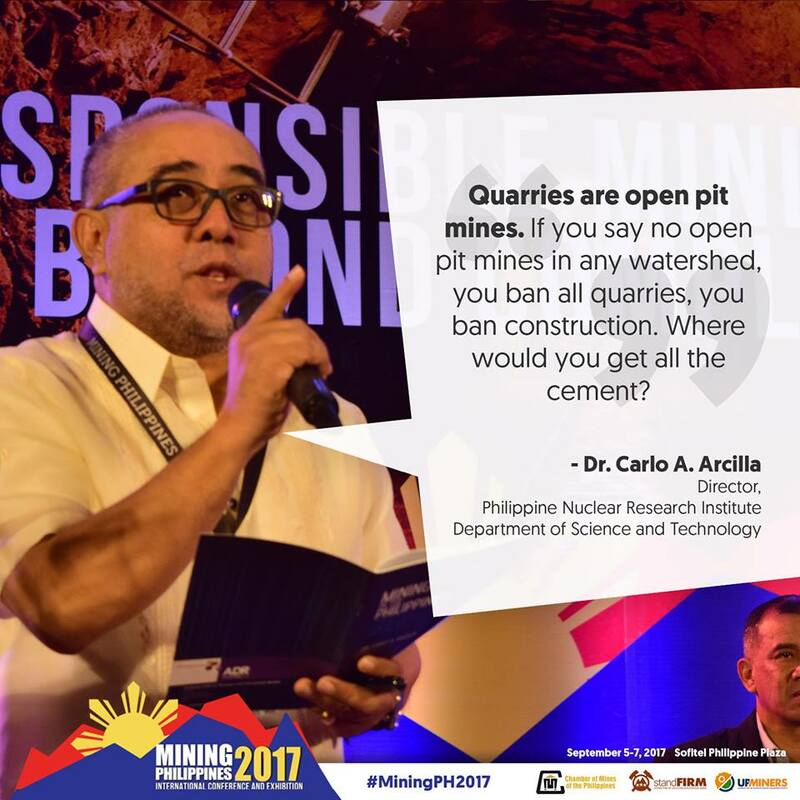 Again one cannot force only one method of mining because the ore deposit or body determines what is used. Are there risks? Of course there are. But that’s why you have experts who require pre testing and constant monitoring during the procedure. Are there accidents? Of course there are. But they are few and far between and sometimes they just happen. Are there examples of successes? Well, my brothers and I are just three of hundred of millions of examples of successful C-Section births, while for mining there countless examples around the world of open pits rehabilitated into such destinations as golf resorts. The point is, in life, one can always choose to focus on the dangers. But then what happens? “Oh my gosh an airplane crashed! We should ban flights and shut down all airlines!”. Or “ An elevator got stuck! Let’s do away with lifts and use the stairs!”. That’s why there are tests: for humans these range from blood tests to BP monitoring, while for environmental projects you have Environmental impact assessments and clearances. Once a patient or a project passes these tests then it means the experts are more than confident everything will turn out fine. So: it’s right to worry about open pit mining just like it’s right to worry about Caesarian operations. But trust your experts. That’s the reason they’re there. And if you like, pray or do yoga. Cool, useful chart below. 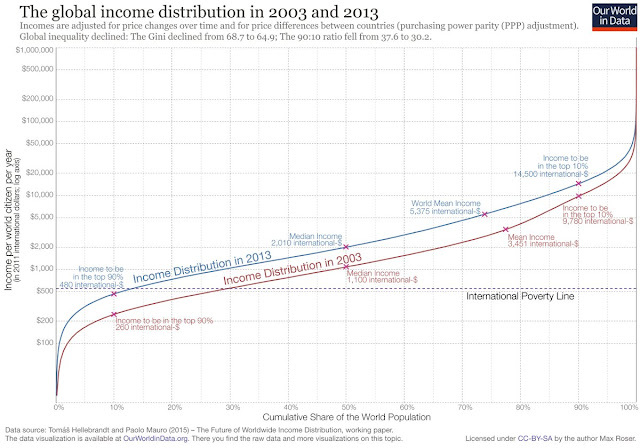 Global poverty has declined, significantly. To read it, choose a level of annual income on the vertical or y-axis and then use the blue and red lines to find on the horizontal or x-axis the corresponding share of the world population living with less than that income. 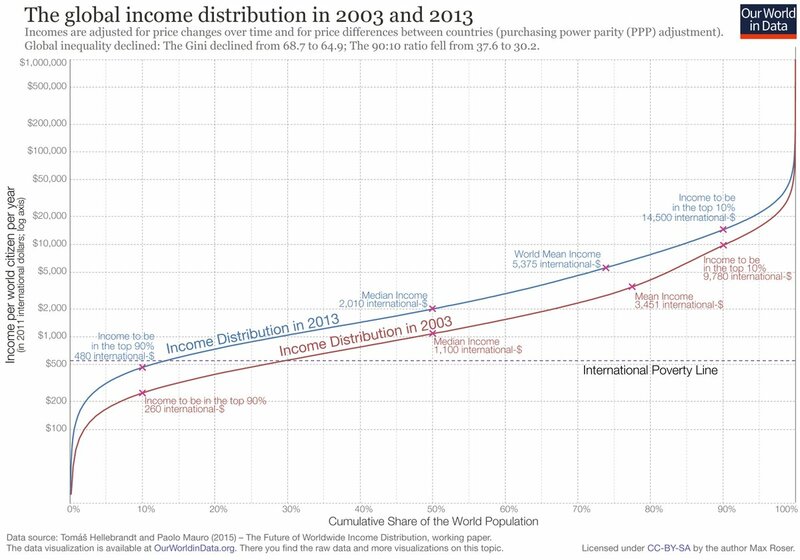 If you think the poverty line should be $1,000 per person per year, the 2003 line shows that 48% of the world population was below this poverty line; and ten years later, in 2013, 29% was below this line. A decline of 20 % points in one decade relative to this poverty line. The rich are getting richer, the poor are getting middle class status. Not all of course but many of them. The poor used to ride bicycles or cow de carabao, now they ride motorcycles or 2nd, 3rd-hand cars. Related to my BWorld article yesterday, Build-build-build is possible without new taxes, are the following articles and reports, all from BWorld. 4. No need for tax-tax-tax in this huge, multi-billion CALAX project. The private consortium has the money, eng'g expertise and other corporate network to finance, build and operate these big infra. 6. And the P18.7 B Kaliwa dam, zero need for tax-tax-tax as it will be an integrated PPP project but Du30 insists we should pay more taxes because we will pay more China loans. BBB (build-build-build) can also mean Beijing-borrowings-barkada ni Dutertah. 7. 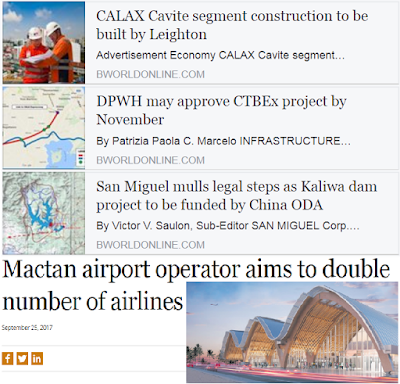 The Mactan-Cebu airport new passenger terminal is a PPP, Megawide contract, P17.5 B project cost. 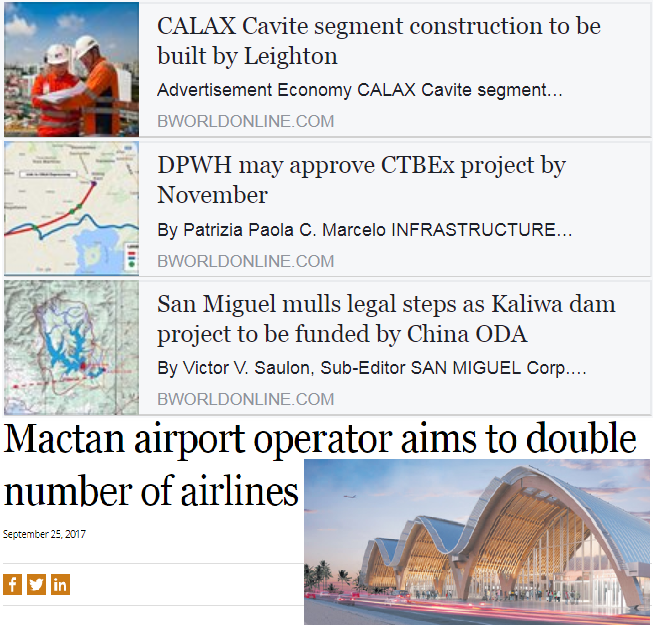 Bigger, construction period shorter, compared to ODA-funded Iloilo airport project. Zero need for tax-tax-tax to build this big, modern, passenger terminal. The tax-tax-tax policy will further sour the business sentiment here. Less money in the pockets of citizens, more money in the coffers of Du30, Alvarez, and thousands of their minions in the Executive and Legislative branches. I have heard about Sir John Cowperthwaite for the first time about 2004 or 2005, from my friends at the Lion Rock Institute in Hong Kong and I was impressed of him. Prior to that, I thought that it was deliberate on the part of the British government to institute a free market colonial economy in HK after WW2. No, it was not the case. The man as Britain-appointed Administrator of HK simply has a firm conviction of positive non-interference by government in encouraging individual and enterprise innovation and entrepreneurship. A book was recently published about the man and here are two of many book reviews. 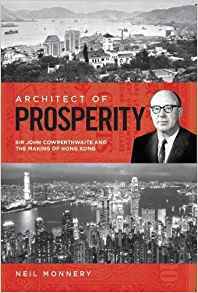 Architect of Prosperity: Sir John Cowperthwaite and the Making of Hong Kong. By Neil Monnery. London Publishing Partnership; 337 pages; £24.50. DURING the 1960s, governments were responding to political unrest and economic challenges with nationalisation, centralised planning and public spending (financed by heavy taxes and debt). There was intense pressure for Sir John Cowperthwaite, the financial secretary of Hong Kong, to join the crowd. Civil servants in Whitehall had been urging their counterparts in Hong Kong to introduce high taxes for some time. Locals demanded spending to address a lack of housing for crowds of poor immigrants fleeing the horrors of post-revolutionary China, and a territory-wide shortage of drinkable water. Meanwhile, the territory’s export-driven economy was threatened by rising global tariffs, prompting demands for public incentives to reorient production towards the domestic market. A new biography of Cowperthwaite by Neil Monnery, a former management consultant, tells of a man who replied to these demands with a qualified “no”, and in the process became that most unusual of things: a bureaucrat hero to libertarians. His approach would subsequently be labelled “positive non-interventionism”, meaning governance stopping just short of laissez-faire. Public housing would be funded, but only for tiny flats; reservoirs would be built, but users would be charged. Much of the rest was left to individuals and businesses to sort out, unfettered by government directives. “Money,” Cowperthwaite said, should be left “to fructify in the pockets of taxpayers”. Cowperthwaite’s ability to resist bigger government was born in a lost era. He was educated in classics and economics at a time when the insights of Adam Smith prevailed. That gave him the foundation to debate with free-spending colleagues influenced by John Maynard Keynes. In 1945, he arrived in a Hong Kong in ruins from a brutal Japanese occupation. A combined military-colonial administration engaged heavily in economic management, and Cowperthwaite’s early jobs included managing the trade in food and raw materials and administering price controls, roles that defined a heavy government hand. But he knew that the territory’s lack of natural resources meant that post-crisis prosperity depended on its ability to attract entrepreneurs and capital. When Cowperthwaite stood down in 1971 his tenure was reckoned a huge success, but that provided only limited protection for his policies. The embargo on data collection was reversed by his successor. Subsequent administrations, both British and Chinese, whittled away the restraints on government intervention. One persistent objection to limited government particularly rankled Cowperthwaite—that it was callous. He was convinced that “the rapid growth of the economy…produces a rapid and substantial redistribution of income [and] makes it possible to assist more generously those who are not, from misfortune temporary or permanent, sharing in the general advance. The history [of Hong Kong] demonstrates this conclusively.” As that history becomes increasingly remote, a biography of a key architect becomes ever more valuable. There are few other examples. Another review is from the Adam Smith Institute. … the small cadre of civil servants, like Sir John, whose job it was to run Hong Kong, fixed on the objective of making it economically prosperous, and knew that the best way to do that was to do exactly the opposite of what the home country was doing—with its nationalisations, controls, economic planning, high taxes, trade barriers, deficit spending, and all the rest. The Hong Kong administrators by contrast rejected the idea of government planning and spending to invest, believing that entrepreneurs knew how and where to invest, and how to manage their businesses, better than any government officials. They kept the government’s books balanced for nearly every year; they resisted high taxes, believing that low taxes would encourage private investment and would expand the long-term tax base. The story is not true, but it is not far from the truth. Cowperthwaite had to fight over and over to resist ‘enlightened’ interference with the Hong Kong people’s lives and businesses, and to maintain his doughty view that economic statistics were a double-edged sword and you should only collect the ones that are really essential…. 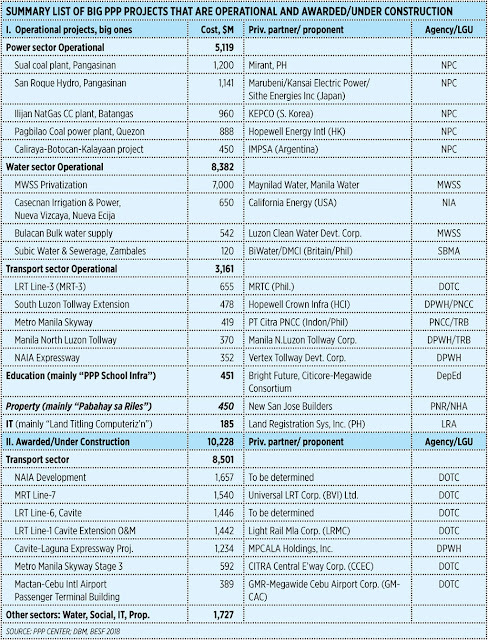 Among the biggest alibis given by Dutertenomics as to why we need new or higher taxes is the fact that the government needs more money to bankroll “build-build-build” hybrid PPP (public private partnerships) plans. Then warnings were issued by both government and its nongovernment allies that “no new taxes, no build-build-build.” For me, this is blackmail and should not easily be accepted by the public. Here are my three reasons. One, there have been many past PPP projects in operation and current PPP projects under construction that did not necessitate large-scale new taxes or tax hikes (see table). Two, an integrated PPP (construction then operation and maintenance (O&M) under one private entity or consortium) will accomplish the task at little financial exposure and burden for the government and taxpayers. And there would be no or little need for many of these taxes. But Dutertenomics is inclined to favor hybrid PPP (construction is government via foreign loans/ODA and/or annual budget/GAA, O&M is private) for some unholy reasons like implicitly favoring China loans, China contractors, and banks. Or using administration cronies as contractors in exchange for big favors. Compare the motive of an administration with only six years in office (only 4+ years in the case of the current regime) vs. big local companies which have been around for the past 30, 50, or 100+ years and intend to be here for the next 50, 100+ years. The former has the tendency to amass wealth quick and worry about political scandals later. The latter would try to avoid political and business scandals as they have corporate brands to protect and will bank on those brands for many decades to come here and abroad. 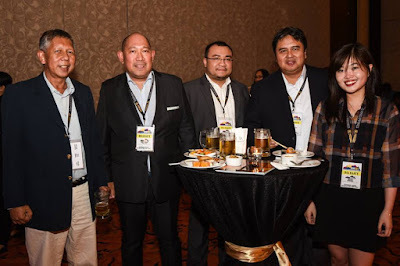 Three, more integrated PPP portfolio for big local firms and consortia means wider experience and more confidence in the field, bigger business opportunities to join PPP projects in our neighbors in the ASEAN and beyond. Philippine-based construction and infrastructure consortia will soon become big multinationals and players in the region and the world. Reducing the country’s personal income tax (PIT) rate should be a social goal and a public service in itself. Earning P500,000 (little less than $10,000) or higher per year and be slapped with 32% income tax is very confiscatory and immediately qualifies the government as creator of poverty. This has been going on for many years now and should be changed asap — without raising or creating new taxes somewhere. In Singapore, the 22% top PIT applies only for incomes of $240,000/year or higher. In Malaysia, the 28% top PIT also applies for incomes of $240,000/year or higher. The Philippines should have top PIT of 28% or lower and apply at $100,000 or higher. Nonetheless, Dutertenomics’ TRAIN will be passed very soon because (1) Congress and Malacañang act like one-party state with no serious significant opposition or fiscalizer, and (2) dishonesty and even some blackmail were effectively used to make the public accept tax hikes. In short, coercion and deception were put to use. After the current package of TRAIN, there will be TRAIN 2 to be introduced next year. The current administration will have been emboldened enough to create new taxes or raise existing ones anytime it wants to because Congress coercion and public deception are going well. A government that intervenes the least, that taxes the least, is conducive to more growth, more job creation, more production of goods and services, and less inflation, less state dependence. We will hardly see that under the current administration.